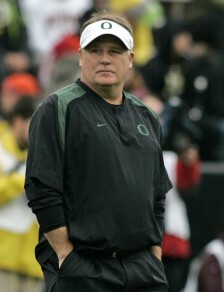 Many people liked to talk about Chip Kelly by describing him as very cold and dry. Many would compare him to Bill Belichick, with his often short, to-the-point answers and dry wit. On top of this Kelly is known for being very businesslike in his management of his football program, maybe even somewhat aloof at times. And even though they were winning, it seems there have always been murmurings about how Kelly drives players too hard at practice, especially late in the year. Now, I just want to explain this isn’t trashing Kelly; the man is a great coach and helped make Oregon what it is today, but these are the complaints people had about him. You can’t say the same things about Mark Helfrich, however. Where Kelly was usually very dry at press conferences, Helfrich often jokes openly. 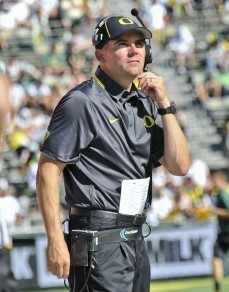 Likewise the football program has evolved more toward Helfrich’s personality. Helfrich does something Kelly was known for not doing — asking for input from his players. Because of this, Helfrich heard his players’ concerns and scaled back practices some in order to keep his team fresh for the end of the season. On top of this, the environment and atmosphere has changed a bit; as Oregon’s offensive coordinator Scott Frost said, ”I think there’s more enjoyment and laughing in our football building than almost any football building in the country.” This enjoyment and ability for the team to have fun, along with the players being fresher, has led to Oregon’s unparalleled sense of camaraderie; out-teamed them indeed. But don’t let Helfrich’s leaning toward being a players coach mislead you. The man is an outstanding coach. It would have been easy for him to keep running the same exact playbook that Kelly used, and just kind of phone it into 10 wins and a bowl game every year. 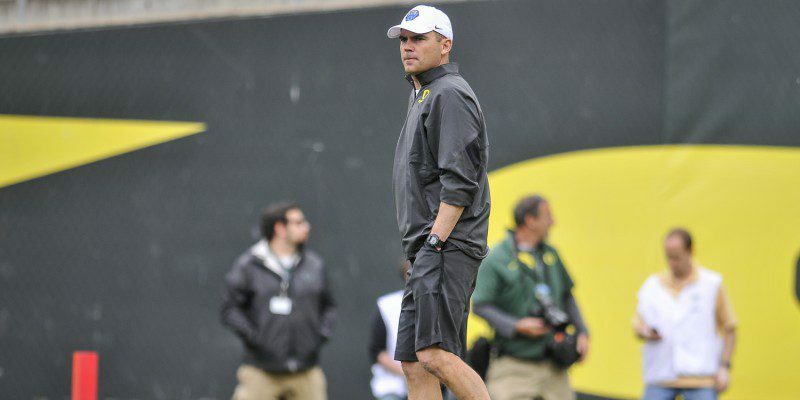 Instead, Helfrich has continued innovating and evolving the Oregon offense. One of the biggest differences under Helfrich has been the balance of the offense, with the passing game not being an afterthought or only a change of pace the way it sometimes was under Kelly. The only question about that passing focus: is it strictly taking advantage of Marcus Mariota’s ability, or is this a concerted effort to balance out the offense? That question will soon be answered, as this is likely to be Mariota’s last year as an Oregon Duck.